Take control of your large-format printing needs with an affordable, cost-effective wide-format printer. Not every important business document is regular letter size. Do you need to print point-of- sale materials? A gigantic spreadsheet? Posters? CAD drawings? Look no further. Datamax Arkansas offers Canon’s lineup of imagePROGRAF wide-format printers, an affordable way to print your own large-format graphics – from 5 feet to 17 inches –on-demand with spot-on image fidelity (color, grayscale, or black and white). Corporate and General Use: Create eye-catching oversize posters, signs, and presentations. Graphic Arts: With photo-perfect quality, the imagePROGRAF lineup is a perfect fit for photography, fine art reproduction, and print-for- pay. Technical Documents: Print CAD and architectural, engineering, and construction documents. Extraordinary Print Quality: Produce high-resolution images, sharp lines, crisp text, fine detail, and smooth gradations. High-Speed Processing: Print ultra-high- quality images with incredible speed. Advanced Inks: Print with an unrivaled color range of durable, fade-resistant inks. Easy-to-Use Software: Expand capabilities, simplify use, save time, and improve productivity with Canon’s dynamic software technologies including PosterArtist 2007, Digital Photo Front-Access, and print plug-ins for Adobe Photoshop and Digital Photo Professional. imagePROGRAF printers are also supported by ErgoSoft’s RIP software solutions. Three levels of output quality for every need. Different needs require different levels of print output. For the best print quality and vibrant color, subtle hues, and perfect shadowing; 12-color is the best option for high-quality art needs such as photographers and studios, fine art reproduction, museum-quality displays, and professional print makers. Print resolutions up to 2400 x 1200 dpi means high-definition image quality. Not every print job needs to be museum quality. The imagePROGRAF S-Series is perfect for point-of-sale displays, GIS maps, and special events graphics. An economy mode decreases cost of operation. Jobs can be submitted easily with network connectivity, the built-in hard drive, and a remote user interface with password-protected mail boxes. These large-format printers are perfect for schools, architects, engineers, and any business that needs to print full-color presentations, maps, signs, posters, and other large-format output. Businesses can assemble spreadsheets, pictures, and graphics onto a single page to add punch to presentations. Print easily readable maps from geographic information systems and computer-aided design files. Schools can create classroom learning aids as well as posters, banners, and signs for fund -raisers, events, and athletic activity. If you also need to copy and scan large-format documents, the imagePROGRAF 750 prints, scans, and copies large-format documents up to 36” wide. When paired with Canon imageRUNNER devices with Universal Send capability, an imagePROGRAF large-format printer can make scan-to-print workflows a breeze so that you can print enlarged documents easily. Whatever your large-format needs are, Datamax Arkansas can help. Discover what a large-format printer can do for your business. Contact us to learn more. 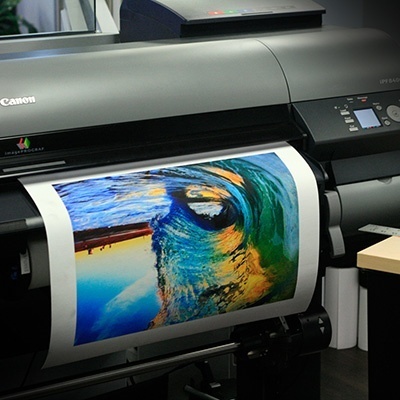 Canon wide-format printers include many technological advances including a one-inch print head with 15,360 nozzles.